It is with great sadness we announce the sudden passing of Florence Esquash, on January 13, 2019 at the age of 76 years. She leaves to cherish her memory her husband, Jim Esquash of 34 years; her children Denis, Robert and Cheryl. She also leaves to mourn her passing her siblings and in-laws, Denis Frisky, Gerald (Linda) Esquash, Charlotte Daniels, Yvonne Esquash and Dorothea (James) Mayner, as well as numerous nieces, nephews, relatives and friends. She was predeceased by her brother Jerry Frisky, her parents-in-law Joseph and Rose-Marie (née Swain) Esquash. 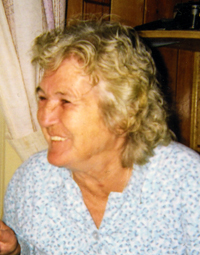 Flo is remembered by her love of cooking, sewing, gardening and spending time outdoors picking berries. Flo had a love for all of her nieces and nephews and any children she met. She enjoyed visiting and meeting new people who came to visit them. She enjoyed baking for her family and her Swan Lake community members. Everyone she knew was a treasured gift to her. A Traditional Wake will be held at the Swan Lake First Nation Cultural Centre on Wednesday, January 16, 2019 at 4 p.m. A Traditional Feast will be held at the Swan Lake First Nation Hall on Thursday, January 17, 2019 at 12 noon. Funeral Mass will be follow the Our Lady of Assumption Catholic Church in Mariapolis, Manitoba at 2 p.m. Interment will take place after Mass at the Parish Cemetery. In lieu of flowers, memorial donations may be made to CancerCare Manitoba or a charity of one’s choice.